So.. Who is Jessie Smith? Step inside our world and meet Jessie Smith. Jessie is one of our newest Wilson Equestrian Ambassadors and we are super excited to have her on board and see where she is headed in the future! My name is Jessie Smith I’m 16 and compete with my best friend, Northern Storm (Storm). Storm is a gorgeous little 15hh 19 years young Standardbred. We first met in 2012 and had initially intended to pleasure ride. In 2013 we went to our first hack show, we were surprised how many of the judges didn’t realise he was a Standardbred until they saw the brand; this is when we realised that we had a very special little man on our hands! We changed our training to get him in competition form, and began competing more, before qualifying for SPPHASA State Championships in 2014. We came home with Runner-up State Champion Rider U/18, now we were hooked! In late 2013 I was diagnosed with Reflex Sympathetic Dystrophy, initially in my right leg. In 2014, as the disease spread to now affect my leg, hip, spine and right wrist, we made the decision to re-train to para. Stormy is a true gentleman and has re-learnt to do everything through voice commands, two whips and specific weight aids. We continued with showing, but began to focus more on dressage. Thanks to our incredible coach and friend Megan Jones, Storm has continued to strengthen his canter, and our flexion has improved out of sight! 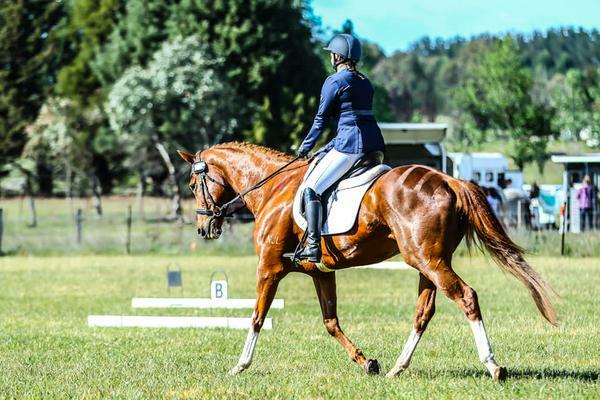 In March we competed at the SPPHASA State Championships, we are currently the 2016 State Champion Best Presented Open Junior Exhibit, State Champion Open Gelding, State Champion Open Rider U/18 and Supreme State Champion Open Rider. Royal Adelaide Autumn Horse Show was also successful, where we gained qualification for Royal Melbourne Horse Show next year, Werribee here we come!! Our goals for the rest of 2016 are to continue to strengthen our canter and work on our extensions in trot, he has the ability to do it, and it’s just a matter of finding a way for us to get there! Storm has a massive trot, so consistency in his gait is really important, something he is really starting to understand. We are currently schooling walk to canter transitions, he does it really nicely, so strengthening them will be fantastic. We are currently training and aiming for the RDA State Championships where we hope to qualify to represent SA at nationals. 2017 Pony Club Nationals are also in our sights, although they’re all the way up in Toowoomba! We have some dressage competitions coming up so going with the aim of beating or improving our score will be our aim, instead of placing. We’re in a new level so we just hope to find our feet and see where it takes us. This entry was posted in Team Riders. Bookmark the permalink. Where have Tayhla and Sym been? ?